As always in South Africa there are many sides and versions of the same thing. Today we look at one of our favorite sweets, the Hertzoggie. 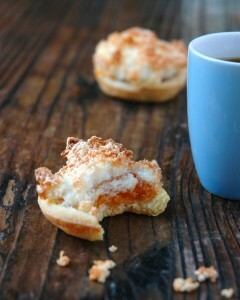 A delightful little confection of buttery pastry, sweet apricot jam and a coconut meringue topping. It is impossible to eat just one. They were named after a prime minister of South Africa (1924 -1939), J.B.M. Hertzog. Must have been his favourite teatime snack and his many supporters baked and served these little tarts like crazy. Hertzog was a direct opponent to Genl Jan Smuts whose supporters immediately developed their own favorite baked item and called it a Smutsie. In recent years local magazines have tried to reinvent the Hertzoggie by creating recipes which is baked in a tray and sliced, but this caused such an uproar that it is unthinkable that one could do that and still call it a Hertzoggie. In the Afrikaner version, it is de rigeur to have a cup-like pastry bottom which holds a generous filling of apricot, and this is baked with the topping of coconut meringue. Most of the outrage to the sliced version was due to the fact that NO self-respecting lady would want the apricot filling to mess on a freshly ironed pair of white gloves! The story of the Malay Hertzoggie, habitually featured in colorful newspaper articles and photographs of Muslim festivities such as Eid in South Africa is an interesting one. 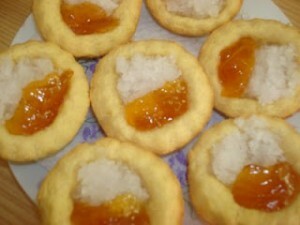 This Hertzoggie is a small, open tart made with two fillings: jam on one side and coconut on the other. Unbeknown to many outside the Muslim community, the cookie serves to recall the other history of Muslim food edited from its exoticised incarnation in many cookbooks. Muslim food arose in the slave era of the Cape, and also has a subversive recent past. A story by the wonderful cookbook auteur Cass Abrahams shows the meanings and resistance encoded in food by the less powerful. This is the story of the legendary Cape Malay cookie, the Hertzoggie: “It goes back to when [Afrikaans general and later Prime Minister] Hertzog was running for power. He made two promises. Now, this is true, if you go back to that particular year. . He said that he would give the women a vote, en hy sal die slaves dieselfde as die wittes, he will make the Malays equal to the whites. Achmat Davids, the late linguist and historian, reckoned the Malays became terribly excited about this and they put this little shortcrust pastry with apple jelly underneath and then had the egg white and coconut on top of it and baked it and called it a hertzoggie in honor of General Hertzog. However, when he came into power he fulfilled one promise, he gave the vote to the women, but he didn’t make the slaves the same as the whites. So the Malays became very upset and they took that very same Hertzoggie and covered it with beige icing, you know this runny brown icing and pink icing and they call it a twee gevreetjie [‘hypocrite’]’. Cream the margarine and sugar in a bowl until light and creamy. Stir in the egg yolks and vanilla essence, blending well. Sift the flour and salt into the mixture, blending well, then stir in a little milk or water to form a fairly stiff dough. Roll the dough out to 5 mm thick on a floured surface and cut into rounds with a pastry cutter. Line greased patty tins with the rounds of pastry. Make the filling. Gradually add the sugar to the beaten egg whites, beating well to blend. Fold in the coconut and mix well. Place a little apricot jam in the centre of the rounds in the patties and spoon some of the coconut mixture over the jam. Bake in the oven at 200°C (400°F) until the pastry is lightly golden, about 15 minutes. Cool completely on a wire rack.